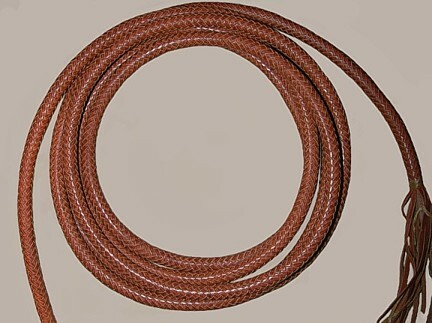 General rule for plaiting string length and string width. For more braiding information, please refer to "The Art of Braiding, The Basic, Third Rev. Ed." 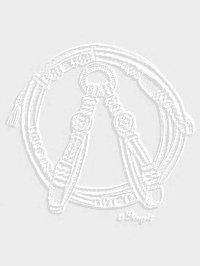 It presents essential braiding skills necessary for almost any project with diagrams that are easy to understand and follow. It is a skill building resource useful for a wide range of braiders with diverse interests. String length, for any number of plaiting (4,6,8,12,16), needs to be 1½ the finished length of the item being braided plus the length needed at each end, which will differ with each project. Another factor effecting string length is each braiders individual style. If a braider tends to pull the strings outward, they will need a slightly longer length; and if a braider pulls the strings downward, forming sharper Vs, they will need slightly less length. This would probably only be apparent in a longer project. Most projects will need an extra 6 - 12 to work with at each end. I suggest you leave a little more than that at each end until you are comfortable with how much string your style requires. The same general rule of 1½ applies to string width. Added together, the total width of the strings needs to be 1½ times the necessary circumference of the item to be plaited. Note: this may vary depending how much the material stretches and narrows as it is being braided. Fig. 1 is a dog collar plaited in 4 plait and the extra string is needed to splice the ends in on the turn back. Fig. 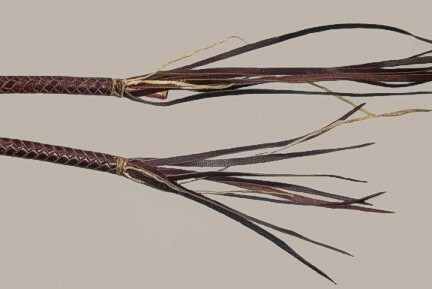 2 is a small item plaited with 8 strings. Fig. 3 is the end of 8 plait reins. Fig. 4 is 12 plait. Fig. 5 is 16 plait. Again no matter how many plait is being braided the rule is the same. 1 ½ times the desired finished length plus the length needed at each end. 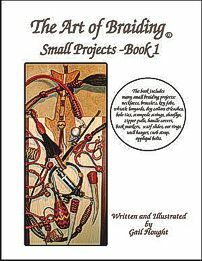 Quick links to the braiding books are below. 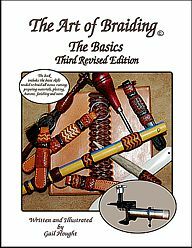 The necessary basic techniques for rawhide braiding & leather braiding, published in 2018. Watch for ongoing images of our newest book in progress. 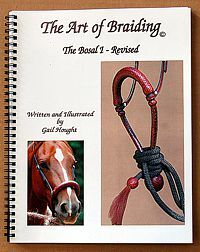 Complete instruction for braiding a bosal. 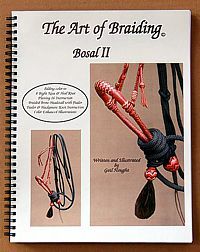 Instruction for adding color to a fancy bosal with fully braided headstall. Most detailed in series. Working and braiding with rawhide. Braiding & expanding long buttons. 8 New Skill Builder projects. Figures braiding Santa Ynez romal reins. 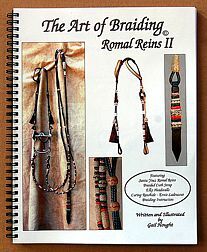 It is the most advanced of the braiding books with emphasis on learning the pattern of larger buttons. 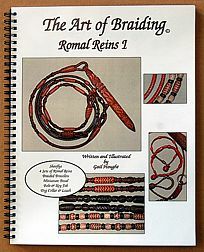 It also includes Elko style headstalls,.slit braiding and chapter about Ernie Ladouceur and curing rawhide. 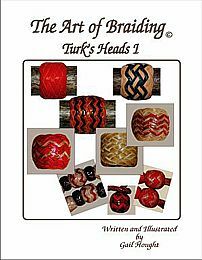 All the Turk's heads and interweave patterns in this book are new to me, therefore, I have not instructed them in any of my other books. The one exception is several new interweaves on the very versatile 5 part, 4 bight / 7 part, 6 bight series of Turk's heads. 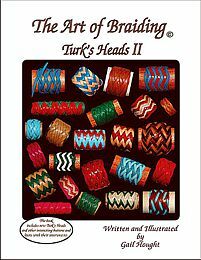 I have always considered these series of Turk's heads the most important to learn. I think in this book, you may find more reasons to learn it. We send our braiding newsletter via email and if it is returned to us because of an email address change, we remove you from our list. If your email address has changed and you wish to continue receiving our braiding newsletter, please update us with your current email.